It is true that many tourists are into nature tourism like Derawan Archipelago. In Berau District, however, many other vacation destinations are available. These include cultural ceremonies, which are done in nearby villages or sub-districts. As for the reference, there is Gunung Tabur Traditional Ceremony. The locals also call it “Menguati Banua” and it is done once a year taking place in Gunung Tabur Palace. The event only lasts for a day, but it would gather lots of visitors including villagers and tourists. What is the purpose? It is said the ceremony helps them to eradicate bad luck and prevent future disasters. 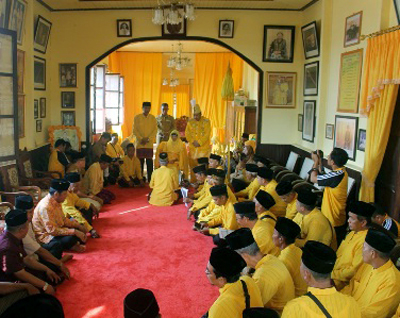 During the ceremony, there is a person who leads the event and tons of locals may gather in Gunung Tabur Palace. The fact is some tourists are also seen in the location. All of these people give a prayer together in order to obtain good luck in the future. They also hope that the village can avoid any disasters or bad luck. Apart from being a signature traditional ceremony, Menguati Banua is considered a lure for visitors as well. It is because tourists are curious about it and want to join the event. Despite such sacredness, the event becomes a new entertainment for tourists. Even foreigners are allowed to join it, but they must follow all the procedures. Here is the thing. Manguati Banua is a local tradition that emits Islamic nuance. No wonder, the locals give a prayer to Allah in order to obtain wellness and avoid bad things like disasters, diseases, etc. In a nutshell, the aim is to cure the village and protect it against any misfortunes. Many people say it is similar to that of Bajau Tribe (Buang Naas). Both of the events aim for the same thing, though. Menguati Banua of Gunung Tabur Sub-district involves several rituals. One of them is to carry some water to a nearby river and it is done after the locals give a prayer to the water. Some people will lead the community prayer in an old mosque located in Gunung Tabur Sub-District. After performing the ritual, they can directly go to the river. Next, they would throw the water away. This way, hopefully, the God would bless villagers with fortunes and wellness in the near future. It is possible to take pictures during the ceremony, as long as tourists have obtained permission from the villagers. After enjoying such unique tradition, tourists can do other things in Gunung Tabur Sub-district. For example, they must try local foods like Buras! It is a signature dish, provided during local ceremonies in fact. However, it is not the only one because there are other options like Talinga Sagayi, Satu, Rangai, and Kajajanga. Apart from the local foods and snacks, they can even enjoy the traditional dance of Dayak Tribe, especially Kancet Dance. First, it takes an airplane to reach Berau District and the destination is Kalimarau Airport, which is located in Tanjung Redeb. From there, tourists can simply head to Gunung Tabur Sub-district by local transportation service.